If a significant artifact on the order of Richard III’s skeleton is ever unearthed around here, I like to believe that the find wouldn’t instigate an internationally publicized squabble between, say, Round Rock and Pflugerville. Emotions run high when honor and tourism are at stake. 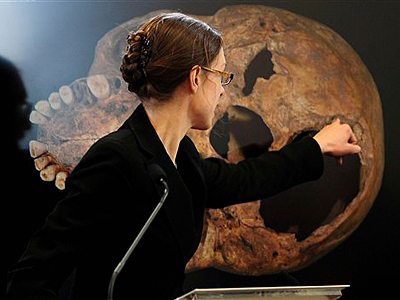 Couldn’t Leicester and York both benefit from returning the remains to York for burial? Leicester could focus on a visitor center chronicling the dig and discovery; York could promote the burial site: traffic neatly distributed, two revenue-generating gift shops. In truth, the controversy does appear to center on finer feelings of loyalty and respect for the dead. York gets my vote. The king had established happier connections there–childhood spent in the region, visits to the city, etc.–whereas Leicester signifies the venue to which his corpse was carted, post-battle, to be hastily stowed for eternity in a grave too short to accommodate his height. 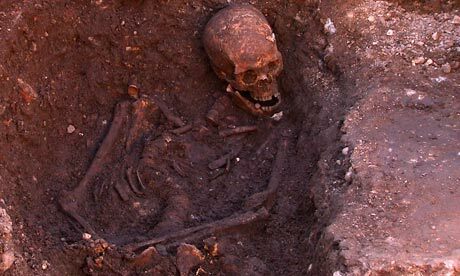 One could argue that if Richard III deserved half the notoriety attributed to him since his demise (no one’s actually proven that he had his nephews killed…) entombment under an eventual parking lot would be about right. However, the king has a considerable body of defenders (and not just the Richard III Society). Just serves to demonstrate that when one is gone, the world does indeed continue to spin. I would give a boxful of autographed advance reading copies to have witnessed the archaeologists’ gleeful realization that the skeleton already deemed “of interest” exhibited that distinctive S-curve of the spine. It’s enough for me to imagine that Best Moment Ever — and to speculate which books in our library’s collection might be just the thing for others fascinated by their amazing feat of retrieval. Speaking of fortunate excavations and how valuable things come to be buried: I’ve been reminded this week how that can happen with library resources. One of our handiest databases, Auto Repair Reference Center, might escape notice simply because it’s one among many databases on offer. Even if you’ve used it to look up service bulletins or wiring diagrams, you could miss “Labor Times,” listed (for most vehicles) near the bottom of the topics page. If your vehicle is included, you can use that feature to learn, before you take your car in, how much time is required for the repair and approximately what it should cost. Oh, and Janette from Youth Services alerted us yesterday about this nifty option in World Book Online: under “Specialty Sites” you can select Craft Corner for age-appropriate educational craft projects.